Detailed below are the instructions detailing how to manage the user permissions for everyone connected to a calendar in ATLAS Scheduler. These instructions are for users who have been granted administrator access to the app. If you have been granted admin access and you follow these instructions, but it seems like options are missing or that the app isn’t working, it may be a technical issue. Email ATLAS at atlas-apps@illinois.edu for additional support if the guidelines below don’t answer your question(s). Click Login and login to Scheduler using your AD Login/Password. 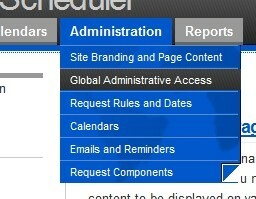 Hover over the “Administration” tab in the upper left-hand corner and click “Global Administrative Access”. Choose the appropriate role and click “Add New User” directly below the list. Type in the person’s NetId (NOT e-mail address) and click “Validate NetId”. Find a user’s NetId by clicking “Lookup NetIds via PH” above (this will open a new tab/window).